On Oct. 12, India’s Congress Party threw in the towel. Prime Minister Manmohan Singh and the leader of the United Progressive Alliance, Sonia Gandhi, said they would step back from the U.S.-India nuclear deal. The Communists, who led the opposition to the deal, won the short-term battle. They argued that the nuclear deal, whose origins go back to 2005, is only one part of a wider embrace between the Indian and U.S. governments. Apart from nuclear cooperation, the alliance is geared toward partnership between India and the United States in “democracy promotion,” the opening up of the Indian economy to unleashed turbo-capitalism, and a strategic military alliance. In other words, Wal-Mart would follow the USS Nimitz into Chennai harbor. Seen in this way, the Communist challenge is not restricted to the nuclear deal, although its defeat gives momentum to wider struggles against the drawing in of India to the platform of U.S.-led imperialism. From 2005 onward, the Communists led a nationwide fight to reveal the class basis of these deals. The deals are not without their benefit to a certain kind of India. Entrepreneurs would get quid pro quo tie-ins with U.S. firms, and Indian arms dealers and nuclear businesses would benefit from the commerce. The fact of an alliance would give a cultural fillip to the growing Indian middle class, for whom its “arrival” on the world stage could be signaled by this deal (including a permanent seat on the UN Security Council). As the debate over the deal heated up in India, the navies of the Quad (Australia, India, Japan, and the U.S.) held a war game off the western coast of India. The Communists used this act to highlight the implications of the deal. One jatha (column) of protesters left Kolkata and the other left Chennai to converge on the port city of Vishakapatnam on Sept. 8 for a massive rally. This was a contemporary version of Gandhi’s Salt March. Back in Delhi a few days later, the Communist Party of India (Marxist)’s general secretary, Prakash Karat, led a march to Parliament and said, “We demand that the government not proceed with the deal unless it satisfies the people’s objections.” A month later, this is just what the Congress Party had to do. In a Parliament of 545 members, the Communist bloc is only 60. These parliamentarians come in the main from West Bengal, Kerala and Tripura, the three areas where the left has a very strong presence. Elsewhere in the country, the left has pockets of influence, but is unable to translate this into electoral terms (drawing in about 2 percent of the votes at most). The bulk of the Parliament is divided between two blocs, the soft-right Congress and its allies (217 seats) and the hard-right BJP and its allies (185 seats). Regional parties that do not line up with these three major blocs hold the remaining 78 seats (among them the largest is a party close to the left, the Samajwadi or Socialist Party, with 36 seats; although it has long since jettisoned its socialism for a corrupt populism). The elite and middle class are split between the hard- and soft-right on such issues as their attitude toward what in India is called communalism (fundamentalism). On issues of social and economic welfare, the two blocs are virtually indistinguishable, except that the Congress Party has within it an old Gandhian section that is yet to be extinguished. That Gandhian legacy has enabled the otherwise “party of free markets” to be held to a Common Minimum Program with the left on issues such as agrarian policy, with the left supporting the Congress government from the outside. The left, therefore, was the only brake against the enthusiasm of the elite and middle class, both of whom wanted to drown themselves in President Bush’s spittle. In Mumbai, the Communists held a public rally where they condemned all talk of a nuclear deal. In terms of the U.S.-India deal specifically, the CPI(M)’s Karat said, “It is part of the strategic and military relations that the U.S. wants to have with India.” It would never be allowed, he said. 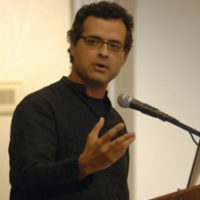 Vijay Prashad is the George and Martha Kellner Chair of South Asian History at Trinity College, Hartford, Conn. His latest book is “The Darker Nations: A People’s History of the Third World” (New Press, 2007).